SMB - What's Up fellow Mountaineers and Adventurers? What’s up guys? I have had a lot of things to do and had little time to update you guys on what is happening with the group. Well buhay na buhay po ang grupo! We ended 2016 with a SMILE outreach in Bulacan and we started the year 2017 with a training climb in Makiling. 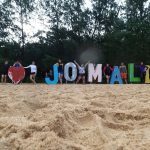 We had our annual summer outing last February in Jomalig Island. Just recently we went to Bakun Benguet and climbed Mount Tenglawan and Mount Kabunian as part of our training for our Guiting-Guiting climb this April. Personally, I had lots of biking activities on the sideline. Other members also have planned trips on their own. So we are planning to have more group oriented activities this year. So how about you? What’s up? Feel free to post a comment and share your adventures. We will be glad to share them with the rest of our visitors here in our humble website. Other adventures are also posted on my Facebook page. Just search Pinoy Outdoorsman.